The Right Revd Dr Patrick Comerford (1586-1652) was the first post-Reformation Roman Catholic Bishop appointed to the Dioceses of Waterford and Lismore (1629-1652). He was a staunch supporter of the policies of the Papal Nuncio, Cardinal Rinucinni, during the Confederation of Kilkenny, and so Comerford became a prominent figure in Ireland, the most important of the clerical conventions were held in his cathedral in Waterford. The Nuncio, accustomed to Roman fervour and ecclesiastical observance, was impressed by the tone of Waterford’s Catholicity and Dr Comerford’s administration of his diocese. Patrick Comerford, or Patricius de Angelis, was born in Waterford in 1586, two years before the birth of his friend and cousin, Luke Wadding. 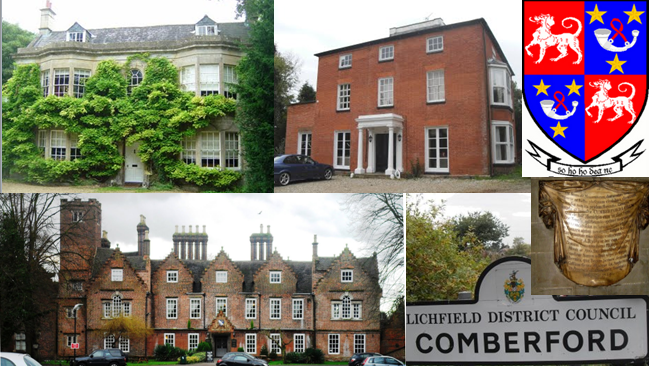 Patrick was a son of Robert Comerford, a Waterford merchant, and his wife, Anastasia White, from Clonmel, Co Tipperary. The Comerford family of Waterford, like their kinsmen and cousins in the Wadding, Walsh and Lombard families, were among the most prominent members of the city’s merchant class, and these families were noted for their Catholic loyalty and as harbourers of priests and friars. Robert Comerford’s brother and Patrick’s uncle was the noted Jesuit scholar, Dr Nicholas Comerford, who graduated at Oxford in 1562 and returned to Waterford for ordination to the priesthood. Deprived of his benefice in Waterford for his refusal to conform, Nicholas moved to Louvain, where he received his doctorate in 1575. From Louvain, he went on to Madrid, where he became a Jesuit and eventually died. Nicholas Comerford was regarded as one of the most accomplished scholars of his time. Although he was comparatively young when he died, he had written extensively on philosophical and controversial subjects [See Comerford Profiles 3: Revd Dr Nicholas Comerford, SJ (c. 1540–c. 1599), Jesuit theologian]. Three of Patrick Comerford’s cousins – Richard, James and Thomas Comerford – were Jesuits, while a fourth Comerford kinsman, the Revd Thomas Comerford, was the Rector of the Rower in south Co Kilkenny – a form of family ecumenism that was not uncommon at the time but that would have little appeal to Patrick Comerford in later life. Patrick Comerford was young when his father died and he was brought up by his mother. He received his early classical training from Father Dermot O’Callaghan, who had been sheltered and befriended by his mother. Patrick then attended Peter White’s seminary in Kilkenny, where his school companions included such future scholars as Luke Wadding, Richard Stanihurst the historian, the future Archbishop of Cashel, John Brenan, Peter Lombard, and other members of the White, Comerford, Walsh, Wadding and Lombard families. White was educated at Oxford, where he became a Fellow of Oriel College, and had been headmaster of Kilkenny College. When he was forced to resign as Dean of Christ Church Cathedral, Waterford, because of his refusal to accept the Anglican Reformation, he set up the school in Kilkenny attended by Patrick Comerford. While Comerford was a student in Kilkenny, his father, Robert Comerford, died in Waterford. This may explain why he returned to Waterford, and there he studied later studied at John Flahy’s academy in Waterford. Flahy was Professor of Classics in Waterford, and his students included members of the Wadding, White, Lombard, Comerford and similar families from Waterford and the neighbouring dioceses of Cashel, Ossory and Ferns. Patrick Comerford was his student in 1603 when Flahy provided an oration in verse for the civic reception in Waterford for Mountjoy. About this time, Flahy moved to Spain, and from 1603 to 1617 he was the preceptor of the Irish students entering the Irish College in Salamanca. At the same time as Flahy left Waterford for Spain, Patrick Comerford travelled to Continental Europe, under O’Callaghan’s care. He was 17 when he left for France to study theology first in Bordeaux. There he was one of the first Irish students at the Irish College in Bordeaux, which had been founded in 1603, and where his fellow students included the historian Geoffrey Keating, who was later Parish Priest in Tubrid when Comerford was Bishop of Waterford and Lismore. We do not know how long Comerford remained in Bordeaux, but while there he distinguished himself as a student of the humanities and Latin. However, weak health forced him to return home to Waterford. After this return visit to Ireland, he went to Lisbon, where he entered the novitiate of the Augustinian Hermits. Some years earlier, his cousin, Richard Wadding from Waterford, a brother of Luke Wadding, had joined the Augustinians. He studied theology in Lisbon and in Coimbra; at Coimbra, his cousin Peter Lombard was Provost, while another cousin, Richard Wadding, was Professor of Theology. Around the same time, Thomas Comerford of the Diocese of Waterford was a student in Salamanca in 1602, while John Comerton or Comerford of the Diocese of Lismore, was a student in Salamanca in 1606. Around 1619, Comerford – who was better known by his religious name of Patricius de Angelis – was sent back to Ireland by his Augustinian superiors as a missionary. 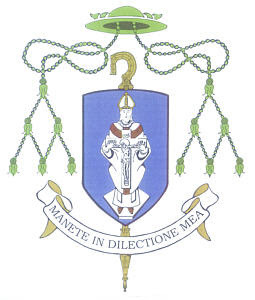 At a general chapter of his order in Rome, he was made definitor and procurator of his order, and was appointed both Commendatory Prior of Kells, Co Kilkenny, an appointment that was confirmed by Pope Paul V, and Perpetual Prior of Callan, Co Kilkenny, a priory formerly held by the Augustinian canons. At the same time, he appears to have been named Vicar-General of Ireland for the Augustinian Canons, an order that was all but defunct in Ireland by then. Comerford has been described as the “last and noblest of all” the Priors of Kells. The priory was in ruins, and the Augustinian community was dispersed through the country round about. He gathered the scattered Augustinians together within sight of their ancient home in Kells, and he secured for them a temporary abode, where, for 10 years, the friars managed to keep their rule, perhaps enjoying the protection of “Walter of the Rosaries,” Walter Butler, 11th Earl of Ormond, and other members of the Butler family of Ormond. However, during this time in Ireland, Comerford probably lived in Waterford although he was working in the Diocese of Ossory where the bishops was his kinsman, David Rothe. He may also have moved between Ireland and France regularly, for a book in French supplied to Lord Carew by James Tobin on 27 February 1621 refers to “Pere Patrice Commerforde,” an Augustinian from the Diocese of Waterford, who was among the Irish churchmen in Bordeaux. 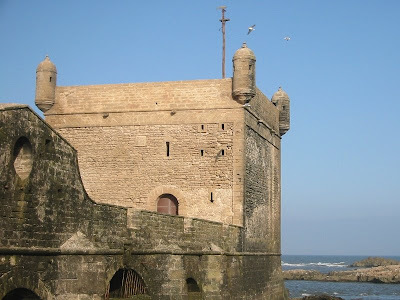 In Waterford, Patrick Comerford heard – probably through one of the Waterford mariners who sailed the Spanish Main – that his younger brother had been captured by Algerine pirates and was being held for ransom at Mogador (Essaouira) on the Barbary Coast, now the western coast of Morocco. In the 17th century, Moorish corsairs frequently raided the Irish coasts and more than one Waterford-bound ship was captured and their crews and passengers sold into slavery or held for ransom. Patrick set out at once for Spain to secure his brother’s release, with funds provided by his friends in Waterford and by the Trinitarian Order for the redemption of captives. Alas, the happiness of these brothers was short-lived. Some accounts say the ransomed brother died as a result of the hardships endured in captivity, while others say he died of the plague immediately on landing in Spain. In any event, he survived his release only a very short time, and was buried in Spain. Patrick then used the ransom he had raised to procure the release of 100 slaves held by the Moors. 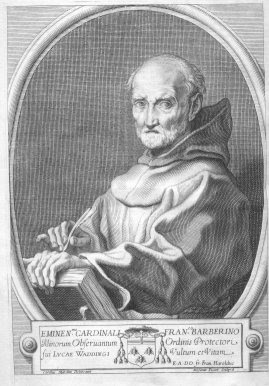 From Spain, Comerford travelled on behalf of the Augustinian order to Rome, where his cousin and former classmate, the Franciscan Luke Wadding, had founded Saint Isidore’s and held the grand title of Qualificator of the Holy Office. It is possible that Comerford was offered the position of Bishop of Derry, but that this appointment was opposed by Hugh O’Donnell, the exiled Earl of Tyrconnell, on the grounds that Comerford was not a native of the region. However, while Comerford was in Rome, the clergy of the Diocese of Waterford and Lismore, headed by the Vicar-General and Dean of Waterford, Lawrence Lea, sent a petition to Rome asking for Comerford to be appointed as bishop of the vacant diocese. In response, Pope Urban VIII nominated Comerford as the Bishop of Waterford and Lismore on 12 February 1629. Urban VIII also appointed Comerford Apostolic Vicar-General of the Regular Canons of Saint Augustine in Ireland. The previous bishop, Patrick Walsh, died almost half a century earlier in 1578 in the middle of Elizabeth’s reign. In the interval, the diocese had been governed by vicars: John White first, then James Walsh, who brought the churches in Waterford over to Rome on the death of Elizabeth I, then Thomas Walsh, who became Archbishop of Cashel, and, finally, Robert Power of the Curraghmore family. A Cistercian monk, Nicholas Fagan of Inislaunaght, had been named to the vacant see before Comerford, but he died before his consecration. And so, Patrick Comerford was the first Roman Catholic bishop in his diocese since 1578, and the first post-Reformation Roman Catholic Bishop of Waterford and Lismore. Comerford’s consecration was the occasion of a great Irish fete in Rome, and an account of the celebrations in Latin was published in booklet form as Coronatae Virtuti Rev. D. Patritii Quemerfordii, with an address of congratulations by the staff and students of the infant Irish College in Rome, founded in the previous year. Two copies of the pamphlet survive in Ireland – one in the National Library of Ireland and the other in the Franciscan Archives. An appendix to Coronatae Virtuti includes a list of distinguished Waterford men of that time who were teaching theology or philosophy on the Continent, including Thomas Comerford in Spain. The printed address also includes a depiction of Comerford’s new Episcopal arms, displaying an adaptation of the talbot or walking dog, red rose and cross of the Comberford family of Staffordshire. Hurley and a Dr Courcey, who was a student at the Irish Seminary, suggested that Comerford chose these arms because of the symbolism of the cross and the thorns of a rose. Comerford returned immediately to Ireland, where he appears to have lived with his brother Philip Comerford. By 1629, the cathedrals in Waterford and Lismore and all the churches in the dioceses belonged to the Church of Ireland. Comerford’s contemporaries as Church of Ireland Bishops of Waterford and Lismore were: John Boyle (1619-1635); John Atherton (1636-1640), who was executed for buggery; and Archibald Adair. Without a cathedral or churches, Comerford went ahead regardless with ordinations, confirmations, and synods of his clergy. However, the Catholic Diocese of Waterford and Lismore had its share of abuses and scandals, and the new bishop was a strong man, morally and physically. He was described as being of great stature, of imposing presence, and of refined and noble bearing. His intellectual gifts were on a par with his physical abilities, and he was said to have been firm will, sound judgment, prudence in counsel and in action. In addition, he was an eloquent preacher, an elegant writer, and a ready conversationalist. He immediately convened a synod of his diocese and appointed five parish priests for the City of Waterford. The Wadding Manuscripts in the Franciscan Library in Dublin include letters from Comerford to his distinguished Franciscan kinsman. On 12 March 1631, the new bishop wrote to Rome earnestly soliciting for himself or for his nephew, Michael Hackett, the “Monasterie of Cahir” or the Augustinian Priory in Cahir, Co Tipperary, which he alludes to as then in the possession of his own cousin, and as having been founded by his ancestors. Meanwhile, in one of his early acts as bishop, Comerford drew up a list of parochial patrons and dedications. This catalogue, like so many other diocesan records, has since disappeared, and the only evidence of its existence comes from a letter from Father Stephen White, SJ (the Jesuit “Polyhistor”) to Father John Colgan, OSF, the Franciscan hagiographer. His reasons for drawing up this catalogue were directly related to his difficulties arising from some controversies with some of the religious orders within his diocese, including the Cistercians and the Franciscans, over their their involvement in the cure of souls, their insistence on pre-dissolution rights, and their opposition to his efforts as bishop to introduce a Tridentine parochial system. Comerford accused the Cistercians in Waterford of having un-canonically seized at least two churches, Saint John’s and Mothel, although they insisted on their rights to them. In 1630, he contested the claim of the Cistercians to Mothel. He argued that they had uncanonically intruded themselves. In a letter to Propaganda reprinted by Cardinal P.F. Moran, the bishop claimed that the Cistercians had usurped possession of three Augustinian monasteries (including Mothel) and that they illegally claimed jurisdiction over the parishes attached to the abbey. In support of his contention that Mothel was an Augustinian house, he appealed to the apostolic taxation books, to the ancient records of the abbey and to documents in the diocesan archives. Mothel had never been of Cistercian affiliation, although it is possible that the Cistercians acted on the ground of a re-grant to them from John Power, 5th Lord Power of Curraghmore, although this would have been uncanonical and invalid. The new bishop inhibited the Cistercian monks from holding Saint John’s Church until the case had been heard by the Supreme Council. However, the Cistercians, who strongly supported the lay impropriator, paid no attention to the mandate. When the bishop then imposed an interdict on Saint John’s Church, the Cistercians still refused to obey. A second interdict, local and personal, was laid on the monastery and the monks. When the case finally came before the Supreme Council or the nuncio, it was decided in the bishop’s favour. A second dispute arose between Comerford and the Franciscans, including their local superior in Waterford, Father Thomas Strong, who was also a cousin of Luke Wadding and who was regarded as a very strong-headed, though well-meaning man. Patrick Comerford’s episcopal activities also extended to the neighbouring Diocese of Ferns in Co Wexford. Patrick Everard, a Waterford Cistercian who had been appointed Abbot of Dunbrody, Co Wexford, by a bull issued by Pope Urban VIII, was entrusted that appointment by Bishop Comerford. However, it is unlikely that Evereard ever managed to take physical possession of Dunbrody – it remained in the possession of the Etchingham family, while Everard served out his days as Parish Priest of Ballyhack, Co Wexford, where he was visited by Rinucinni, and died of the plague in neighbouring Duncannon in 1650. “Your friend Comerford of Waterford is an honest man, and if any should report ye contrary to you, suspend to believe any whit than well of him. He has entered into a charge where every body did what it pleased himself hitherto and now yt ye good man would faine give a forme or face to ye confused administration wch was heretofore he indureth much contradiction from such as ought to assist him and I am sorry yt I must depose of our Fr. Strong yt he is a party against him and generally held in this land to be the maine stickler against ordinary jurisdiction and yet him self asserteth the charge of ordinary beyond many others, as is sayed of him. I doubt not but yt tou have heard how Waterford is vexed by Cistercians and a pretende chaplain of Malta in all wh Fr. Th. Strong has his oare. “ye 6 of January, 1630. Comerford appears to have been a well-dressed bishop. In 1637, an Order in Council required the Mayor of Waterford to restore to the Church of Ireland Dean and Chapter of Christ Church Cathedral, Waterford, “certain copes and vestments, which he had in his possession.” The mayor appears to have been holding the copes and vestments for Comerford’s use. They included five copes and a set of chasubles, and a dalmatic and tunicle with sides and maniples – enough to turn out any bishop in high style. When the Irish rebellion of 1641 broke out, Edmund Butler, son of Lord Mountgarret, took Waterford in December, and Dungarvan, Co Waterford, and Clonmel, Co Tipperary, were taken in the same month by Richard Butler of Kilcash, a brother of Ormond. Comerford took possession of Christ Church Cathedral, Waterford, that year, and immediately moved to replace the altar and furniture in the cathedral. 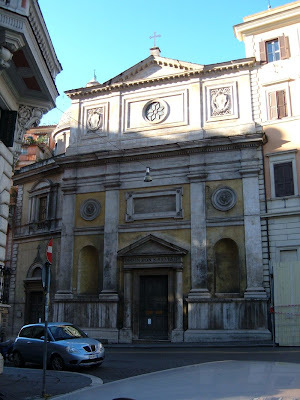 He also attached Saint Catherine’s Church, an Augustinian foundation, to the cathedral. However, Comerford abstained from identifying politically with the rebels until later in the following year. In May 1642, as Episcopus Waterforden & Lysmoren, Comerford was present at the conference of bishops in Kilkenny in support of the Confederation of Kilkenny. That conference was presided over by his kinsman, David Rothe, Bishop of Ossory, and Comerford had a large share in framing the Oath of Association that formed the bond of union between the Confederated Catholics, and sat as one of the spiritual peers in Parliament of the Confederation of Kilkenny in October 1642. In 1646-1648, Comerford was one of the bishops who took part in the proceedings of the Confederation of Kilkenny. At that time, he also took possession of Christ Church Cathedral, Waterford. He was, perhaps, the staunchest of all the Nuncio’s supporters, and of all the cities that Cardinal Rinuccini visited he admired Waterford most. At the door of Waterford Cathedral, the cardinal was met by the bishop, who, with full ceremonial, conducted him to the throne. During the visit, the Nuncio described Waterford as “A Little Rome” (Parva Roma) – the Italian Prelate’s sobriquet all but replaced Henry VII’s Urbs Intacta as Waterford’s moniker for a time. The Bishop of Ossory, the Right Revd David Rothe, presided over the episcopal conferences and synods called in Kilkenny in support of the Confederation. Patrick Comerford was among the bishops who signed the declaration of prelates at Kilkenny on 27 April 1648. Although the meetings of the Confederate Parliament occupied much of Comerford’s time, he managed to write a book on polemical theology during that time, and completed lists of the patron saints of the diocese and the deans of Waterford Cathedral. The Confederation of Kilkenny was composed of two mutually jealous, distrustful and suspicious parties: the old or native Irish and the new Irish or Catholics of the Pale. The Anglo-Irish party was not averse to a peace, which the Nuncio condemned because it did not provide sufficient guarantees of freedom of religion. Rinuccinni summoned a synod at Waterford to consider the situation. He chose Waterford because he regarded it as the most Catholic city in Ireland, because its bishop was the man he trusted most, because the fort of Duncannon, Co Wexford, with its Catholic garrison, was close at hand, and because Waterford harbour afforded swift and sure communication with the Continent. Comerford may have initially sympathised with the peace terms negotiated with the Earl of Glamorgan in 1645, but later joined the other bishops in backing Rinuccini’s opposition to them, and a year later, in 1646, he was primarily responsible for the rejection in Waterford of the peace reached with the Duke of Ormond [see Profile, .]. The synod declared that all who should favour the peace were perjurers and excommunicated them. Later, the Nuncio pronounced excommunication against all bishops, clergy, or laity who accepted the peace, and he placed the whole of the country under an interdict to punish the advocates of the terms of the agreement reached with Ormond. During the months immediately after the synod of Waterford, the Nuncio resided almost constantly in Waterford, where he was the guest of Comerford, who entertained him with lavish hospitality. Together they paid many visits to Duncannon, waiting with expectation for a ship that they hoped would bring money, munitions of war, and further instructions from Rome, but that never came. The Nuncio’s strong measures only deepened the divisions within the Roman Catholic community in Ireland. Canonists pronounced the censures invalid, and while some places observed the interdict others treated it with contempt. Comerford was the bishop most devoted to the Nuncio’s policy, and he was scrupulous in obeying the interdict, with its almost insupportable burden: Mass was not said, bells were not rung, and the sacraments were administered only to the dying. After Rinucinni fled Waterford in May 1648, the clergy of Waterford petitioned for the removal of the interdict. At a meeting of the city deanery in the cathedral on 12 November 1648, a resolution or petition was drafted asking the Nuncio to withdraw the terrible censures. The signatories included the bishop; Father Peter Stronge, Superior of the Dominicans of Waterford; Father Joseph Everard, Guardian of the Franciscans, Waterford; Father John Hartry, Cistercian and Notary Apostolic, Waterford; Edward Clere, Rector of the Jesuit House, Waterford; Father Michael Barron, Prior of the Augustinians; Father Robert Power, Dean of Waterford; and the bishop’s nephew, Father Michael Hackett, the Precentor of Waterford. The Deanery of Clonmel approved a similar petition, signed by Thomas White, Vicar, Clonmel; Father Edmund or Edward Bray, Franciscan, Clonmel; the Revd Thomas Prendergast, STD, Clonmel; Father Edmund Brayns, Franciscan, and Father John Gough, Father William McGrath, and Father Andrew Sall, Jesuits of Clonmel. A notable absence from the list is Geoffrey Keating, although Keating was a staunch adherent of the bishop’s policy, and his last work of writing was a poetic appeal to his countrymen to reject Ormond’s peace. On 25 June 1649, the patrons of the Parish of Cahir, Sir George Matthew of Thurles and his wife Eleanor Butler, Lady Thurles, as representatives of the Baron of Cahir, a minor, nominated the Revd Constantine O’Donnell to the vacant parish and petitioned Bishop Comerford, to grant confirmation. This is, perhaps, the last recorded presentation by a layman in the diocese of Waterford and Lismore. Meanwhile, Rinucinni’s opponents on the Supreme Council deprived Comerford of the little that remained to him of the temporalities of his See. He escaped an attempt to arrest him by retiring inside the walls of Duncannon. Within a few months, Oliver Cromwell stood before the walls of Waterford on 24 December 1649. The story of the city’s defence and the citizens’ refusal to accept aid from Ormond’s troops is part of the saga of events that unfolded. Nevertheless, Cromwell failed at Waterford, and during the siege Bishop Comerford remained in the city encouraging and exhorting the troops and ministering to the dying. Later, when Waterford surrendered after a second siege to Cromwell’s son-in-law, Ireton, on 6 August 1650, the bishop sailed for St Malo in August 1650. Before his ship reached Brittany it was plundered twice by pirates. In a letter to the Archbishop of Fermo on 25 March 1651, he described how two of his nephews, Paul Carew and John FitzGerald, had died of plague. Shaken now in health, worn out by hardships and anxiety, heart-broken for the woes of his country and the fate of his people, Patrick Comerford survived in exile in Nantes for only two years. The other Irish bishops living in exile in Nantes included Robert Barry of Cork and Cloyne, Nicholas French of Ferns, John de Burgh of Tuam and Francis Kirwan of Killala. In Comerford’s absence, the Diocese of Waterford and Lismore was administered by the Vicar-General and Dean of Waterford, Robert Power. Patrick Comerford died at Nantes, the capital of Brittany, on 10 March 1652, aged 66. He was buried in the episcopal vault by the high altar in Nantes Cathedral with full episcopal honours. Ici repose révérend père en Dieu, Patrice de Comerford, evesque de Waterford et Lismore en Irlande. Perécuté dans son pays par les factieux d’Angleterre, il se retira en France ou il trouva sureteté et protectio. Plein de confince dans les bontés de l’Eternal, il vécut avec patience et supporta les malheurs de cette vie avec resignation. Il mourut l’an du Seigneur 1652. When Bishop Comerford’s grave before the altar of Saint Charles was opened ten years later for the burial of another exiled Irish prelate, Robert Barry, Bishop of Cork and Cloyne and a former chaplain to the Countess of Ormond, who died on 7 July 1662, “the body of Dr Comerford was found quite incorrupt.” The slab was removed to a more conspicuous place in 1779, according to the chapter records, but was destroyed with many other monuments in Nantes cathedral during the reign of terror in the French Revolution. On the death of Bishop Patrick Comerford, the Papacy reverted to governing the Diocese of Waterford and Lismore through Vicars-General. The vicar-general from 1648 to 1676 was the Dean of Waterford, Robert Power of the Curraghmore family. Thomas White, “lately dead,” had been Vicar General of Lismore, but for some time before his death, White, who was 80 years of age, was “useless to rule.” Comerford was not succeeded as Bishop of Waterford and Lismore until John Brenan became bishop in 1671. Power speculates that Brenan may have known Patrick Comerford “by sight and perhaps he had gone to hear him preach in the historic St Canice’s.” Brenan later became Archbishop of Cashel (1677-1693), where he was succeeded as archbishop by Edward Comerford (1695-1710) [see Comerford Profiles 10: the Most Revd Dr Edward Comerford (ca 1644-1710), Archbishop of Cashel]. Meanwhile, the copes, chasuble, dalmatic and other vestments, which the Mayor of Waterford had been holding for Patrick Comerford’s use and which an Order in Council had required be returned to the Dean and Chapter of Christ Church Cathedral, had never been returned. Comerford’s successor, John Brenan, complained that the ecclesiastical ornaments of the Diocese of Waterford and Lismore had been taken away to France by Comerford in 1651. The church finery disappeared for generations, but they were literally unearthed when Bishop Richard Chenevix ordered the demolition of Christ Church in order to build a new cathedral for the Church of Ireland. During the demolition work between 1774 and 1779, the missing vestments were discovered in the cathedral crypt. 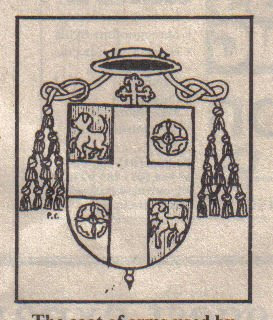 Chenevix was on such good terms with his Roman Catholic counterpart that he presented them to Bishop William Egan. Over a century after Patrick Comerford’s death, a new spirit of ecumenism was now in the air in Waterford. Bishop Egan was pleased with the vestments, and he also delighted in the new cathedral commissioned by Chenevix. In fact, he was so pleased that he also asked the architect, John Roberts (1714-1796) to design him a new cathedral in Barron Strand Street, the first post-Reformation Roman Catholic cathedral in Ireland and now the oldest in the country. Bishop Patrick Comerford’s vestments, which he had once been accused of stealing, are now on exhibit in the Waterford Heritage Museum. But if he was less than ecumenical by today’s standards, we might credit him with some part in ensuring a wider celebration of Saint Patrick’s Day on 17 March. He chose 18 March as the day for his Episcopal consecration in Rome, and it may have been through his influence that his cousin Luke Wadding had the feast of Saint Patrick inserted in the Roman Calendar for 17 March and made a feast of the Church. 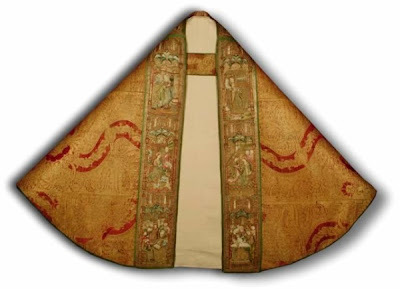 Meanwhile, Bishop Patrick Comerford’s once-missing vestments, including the bishop’s cope, made of splendid cloth and gold in the mid-15th century, are now on display in the Waterford Museum of Treasures. The vestments on display include two copes, a chasuble and a dalmatic, and they form the only complete set of pre-Reformation High Mass vestments to survive in Britain or Ireland. These 500-year-old examples of the 15th century art of weavers and embroiderers are potent reminders of Waterford’s connection with the High Renaissance in Italy and Flanders as it was on cloth, especially tapestry, that the merchant princes, royalty and church bestowed the most lavish patronage, and they provide a rare insight into the richness of liturgical practice in late mediaeval Ireland. The semi-circular Magi Cope is one of the finest pieces in the collection. Made of four full widths of velvet and two pieced ends, it is 1.4 metres long and maximum 2 metres wide. Made of cloth-of-gold with crimson velvet pile of two depths, it has a large asymmetrical pattern composed of undulating stems, leaves and a stylised pomegranate design. The pomegranate is a fruit symbolising fertility or in the Christian context spreading the message of Christ. Most specialists agree that the velvet came from a Florentine loom about 1480. The magnificent embroidery on the hood and orphreys is worked with silver-gilt metal thread and coloured silks and split brick and stem stitches, couched work and the or nue technique on linen fabric. The columns framing the scenes on the hood and orphreys are also worked in silver-gilt metal thread on separate pieces of linen fabric cut to shape and applied. The gold work (flat-laid metal threads stitched down in patterns by shaded silks) was a technique perfected in Flanders. The faces of the figures are Flemish, as are the details of architecture, of dress and of armour. 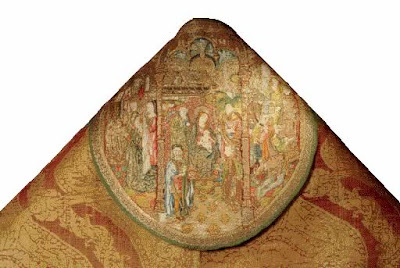 The embroidered panels on the orphreys have New Testament scenes representing the birth and childhood of Christ with the Visit of the Magi on the hood as the central theme. The scenes are the Meeting of Joachim and Anna at the Golden Gate, the Presentation of the Blessed Virgin, the Annunciation, the Circumcision, and Jesus among the Doctors. The artist skilfully depicts Christ among the Doctors whose learned faces and the varying expressions of gravity, pomp and astonishment have all the meticulous naturalism of a Jan Van Eyck painting and the stage directions of the Mystery plays. Artists skilled in miniature painting and familiar with the rich contemporary sources drew each panel. There are nine figures in the Doctors’ panel measuring only 46 x 24 cm, yet there is no sense of overcrowding. The hood depicts three scenes – the Visit of the Magi in the centre with the Queen of Sheba’s visit to King Solomon on the left and Abraham’s visit to Melchisedech on the right. This type of pictorial representation with events from Christ’s life illustrated by parallel scenes from the Old Testament goes right back to the mediaeval teachings. Many artists drew inspiration from the Golden Legend and the Apocryphal Gospels, sometimes following them very closely. With the invention of printing in the 15th century, the triple statement of the Gospel theme was elaborated in the Biblia Pauperum (from its wood-cut illustrations it became known as the Bible of the Poor), the most popular book of the day with widespread circulation in Flanders. Its influence on contemporary art and the production of the Mystery plays cannot be overlooked: in it, the artists found their theology and Christian symbolism presented in pictorial form and for the first time they had in their workshop a framework of ideas. The Visit of the Magi on the Waterford cope is almost certainly inspired by a page in a 15th-century Flemish copy of the Biblia Pauperum. 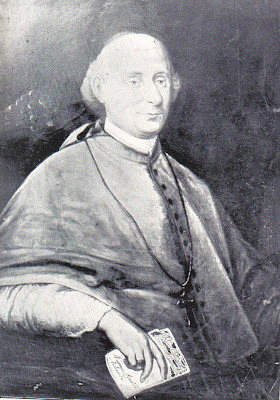 Carrigan 4, p. 63; Wall, Parnassus, p. 717; Moran, p. 174, although Moran gives 1586 as an approximate date; (Most Revd) RA Sheehan (Bishop of Waterford and Lismore), ‘An Irish Diocese in the Seventeenth Century,’ Irish Ecclessiastical Record, 4th series, vol 1 (Dublin: January to June 1897), pp 8-9; (Revd) A Walsh, OSA, ‘Irish exiles in Brittany III,’ Irish Ecclessiastical Record, vol 2 (Dublin: July to December 1897), pp 125-126. Patrick Hurley, ‘Memoir of Dr Patrick Comerford, OSA, Bishop of Waterford and Lismore, 1629-1652,’ Irish Ecclessiastical Record 3rd series, vol 8 (Dublin: December 1887), suggests ca 1583 for his birth (p. 1083). Robert Armstrong, ‘Patrick Comerford,’ Dictionary of Irish Biography (eds James McGuire and James Quinn), vol 2 (Cambridge: Cambridge University Press, and Dublin: Royal Irish Academy, 2009), p. 716, suggests he was born ca 1584. Power, Brenan, p. 244; Sheehan, p. 11; Hurley, p. 1083; Armstrong, p. 716. Dowling, Continuity Ossory, pp 247-249. Wall, Parnassus, pp 709-711; for Flahy, see TW Moody, FX Martin, FJ Byrne (eds), A New History of Ireland, vol 3 (1991), pp 563-565. Wall, Parnassus, p. 710; see Archivium Hibernicum 2, pp 7-35. Sheehan, p. 11; Walsh, p. 126; Hurley, p. 1084; Carrigan 4, p. 63; Armstrong, p. 716. Wall, Parnassus, p. 719; Walsh, p. 126; Hurley, p. 1084; Armstrong, p. 716. Flanagan, Luke Wadding, p. 2. Carrigan 4, pp 63-64; Wall, Parnassus, p. 719; Moran, p. 175; Walsh, p. 127; Hurley, p. 1084; Armstrong, p. 716. Wall, Parnassus, p. 719; Sheehan, p. 11; Carrigan 4, pp 63-64; Moran, p. 175; Hurley, p. 1084; Armstrong, p. 716. Moran, p. 175; Walsh, p. 127; Carrigan 4, p. 63; Sheehan, p. 11; Hurley, p. 1085; Armstrong, p. 716. Moran, p. 174; Carrigan 4, p. 63. Moran, p. 175; Hurley, p. 1085. Cal State Paps Irel James I (1615-1625), pp 316-318. Hurley p. 1085 (citing a letter from Tyrconnell dated 18 November 1628 in the Irish College, Paris); Hurley, p. 1087; Carrigan 4, p. 64; Moran, p. 175; Journal of the Waterford and South-East of Ireland Archaeological Society, vol 1 (1894-1895), p. 178; Armstrong, p. 716. Moran, pp 175-176; Sheehan, pp 11-12; Hurley, p. 1085; Wall, Parnassus, p. 716. Wall, Parnassus, facing p. 717; Hurley, pp 1086-1087. Sheehan, p. 13; Wadding Mss, Dublin. Spicilegium Ossoriense, vol. 1, p. 167. Hore 3, p. 117; Journal of the Waterford and South-East of Ireland Archaeological Society, vol 1 (1894-1895), p. 80. Sheehan, p. 15; Hurley, 1087; Carrigan 1, pp 99-101; Armstrong, p. 716. Brennan, Ecclesiastical History, p. 452. Historical Manuscripts Commission 10/5 (London, 1885), p. 375. Sheehan, pp 16-17; Armstrong, p. 716. Sheehan, pp 17-19; Armstrong, p. 716. Moran, p. 178; Sheehan, pp 19-20; Hurley, p. 1090; Armstrong, p. 716. Sheehan, p. 20; Carrigan 4, p. 64; Armstrong, p. 716. Moran, p. 178; Spicilegium Ossoriense, vol 3; Walsh p. 130; Hurley, pp 1090-1092. Sheehan, p. 20; Moran, p. 178; Walsh, pp 131-133. PM Egan, History of Waterford. (Professor) Patrick Power, A Compendious History of the United Dioceses (Dublin and Cork: Cork University Press, 1937). (Canon) Power, Waterford’s Saints & Scholars (Waterford: Waterford News, 1920). 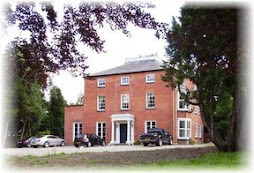 Revd Joseph O’Shea’s life of Father Luke Wadding. © Patrick Comerford, 2007, 2009, 2010, 2011, 2013. Last revised and updated 6 and 17 August 2009; 13 April 2010; 7 June 2011; 13 and 14 April 2013.